Sports medicine and therapy is a distinct division of Health Care Sector, which takes care of physical fitness and injuries associated with musculoskeletal issues. Sports Medicine comprises several forms of non-surgical orthopedic treatments. 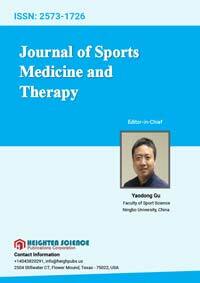 The Journal of Sports Medicine and Therapy works with the aim to publish manuscripts that can provide insights to achieve optimal competence for the sports medicine physicians and therapists involved in the rehabilitation of acute and chronic injuries as well as in developing measures to reduce the risk of injury and illness severity. The Journal of Sports Medicine and Therapy traverse all the facets of sports medicine and therapy including the prevention and management of sports related injuries and occupational problems. The increasing personal and economic health burden of non-communicable diseases has intensified to such an extent that it cannot be sustained indefinitely unless there is a significant global emphasis on sport and exercise as key elements to address this epidemic situation.